If the Meshkat became operational with the capabilities purported by Iranian officials, it would be one of the longest ranged warhead delivery vehicles in the Iranian arsenal. 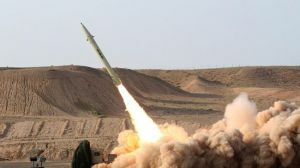 Matched in range only by Iran’s Shahab 3 and Sejjil medium ranged ballistic missiles, Meshkat would be able to reach targets as far as Israel, Southeastern Europe, and Northern India. In terms of missile defense, cruise missiles pose a unique threat that could put added strain on regional missile defense systems. According to a study by the Rand Corporation, Aegis equipped BMD ships can direct their A/N Spy-1 radars to detect for either cruise missile or ballistic missile threats, but not both simultaneously. This fact would likely reduce overall ballistic missile detection and discrimination capacity, as Aegis ships would need to operate in pairs and bifurcate their radar operations between cruise and ballistic missile detection. As of May 2018, the Iranian military has not yet successfully tested a Meshkat missile. “Cruise Missile and Ballistic Defense,” Rand Corporation, accessed June 24, 2014,http://www.rand.org/content/dam/rand/pubs/monograph_reports/MR1449/MR1449.ch3.pdf .